So here we are, the last day of November, and I have not blogged a single word about this fall in Philadelphia. I mean, I am a little busy with school... (that's an understatement!) Brief overview of my life: I student teach 18 little kindergarteners alongside a wonderful mentor. When I'm not student teaching, I take lots of classes and write lots of papers. And in my free time this fall, I have been... wait for it... RUNNING! Some of you are probably scratching your heads, because of all the things I identify myself as/with, running is absolutely not one of them! But back in June, I decided I wanted to become a runner this year. So Dustin and I registered to run the Philadelphia Half Marathon, and I started running. A short bout of vertigo in August set me back a few weeks, but I picked it back up and trained for three months, running up to ten miles along the Schuylkill River on what seemed like the coldest mornings of the week! Then came November. Dustin arrived on the 13th, and we had a wonderful reunion after being apart for 5 months. On Sunday the 18th, we woke up ridiculously early and made our way over to the art museum. And we did it! 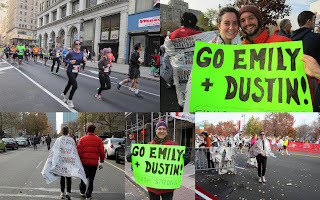 We ran the half marathon and both met our goals: he got an impressive time, and I finished! 13.1 miles. It was fun to have my parents and the crowds cheering us on, and to be able to entertain myself people-watching the other 30,000 runners! After the race, we went to Quakertown and had a party with most of my extended family - to celebrate the race and for them to meet Dustin. Never did I think I would run a half marathon. Never. Remember Pico Duarte? I could hardly walk 13 miles then! So even though I have no desire to do another race, I am glad that I did this one. It forced me to make exercise a priority during these crazy transition months, and it made me a healthier, stronger person. (sounds cliche, but it's true) After the race, we went to Quakertown and had a party with most of my extended family - to celebrate the race and for them to meet Dustin. I will maybe (no promises, though!) add another post soon about Dustin's visit. Here are some pictures for you! The first set are race pics. The white thing around me is a foil heat sheet (emergency blanket) - that was the first thing they handed us when we crossed the finish line because it was so cold! 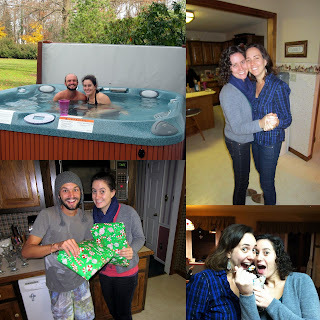 Pics from Quakertown: post-race hot tub session (definitely good for sore muscles! ), fun with Katy, ice cream sundaes (recovery food, right? ), and early Christmas presents from my parents.